What do the Chinese mean when they say that their political systems is "democratic"? With recent improvements in relations between China and the West, this question is basic to an understanding of the Chinese people in their state. 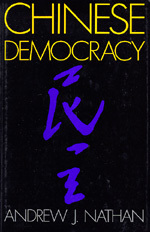 In Chinese Democracy, Andrew Nathan investigates in depth the nature and meaning of "democracy" in China today, beginning with a vivid history of the short-lived Democracy Movement of 1978-1981, when groups of young people in a number of Chinese cities started issuing outspoken publications and putting up posters detailing their complaints and opinions. Nathan constructs--for the first time--a poignant picture of this burst of liberal activity, and at the same time he shows how distinctly Chinese it was and how the roots of its failure lay as much in history as in current political necessity. readers of this book will gain a new perspective on the nature of democracy as the Chinese practice it. Andrew J. Nathan is a professor of political science at Columbia University. He specializes in Chinese politics, foreign policy, human rights and political culture.